When considering buying a new air conditioning system, it's important to understand all the factors that affect performance and efficiency. Not every system is right for every home, which is why Air Inc. Heating and Air Conditioning is here to help you choose the right AC system for your needs. When you call us for air conditioning installation or replacement, we'll go over factors such as sizing, efficiency ratings, and your current ductwork system to help find the best AC system for you. 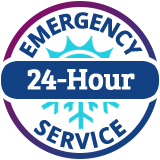 Call us today for a free estimate on any of air conditioning services in Branford, North Haven, Guilford, and the nearby areas! Air conditioners are rated by the number of British Thermal Units (BTU) of heat they can remove per hour. Another common rating term for air conditioning size is the "ton," which is 12,000 Btu per hour. The size of the air conditioner you need depends on the size of your home and how frequently you use it. If you're ready to install a new air conditioning system in your home, the experts at Air Inc. Heating and Air Conditioning are here to help. We will evaluate your home and recommend the best air conditioning system for your needs. Call us today at 1-844-359-5454 or contact us online to get started with a free estimate! We offer all our air conditioning services in Branford, North Haven, Guilford, East Haven, Madison, New Haven, Hamden, West Haven, Milford, Woodbridge, and throughout the surrounding areas.